Love City Strong is a non-profit organization that serves the U.S. Virgin Island community of St. John by aiding in disaster response and recovery and addressing public needs that fall outside of the jurisdiction of other local entities. In the aftermath of Hurricanes Maria and Irma in 2017, many homes on St. John do not have safe, potable water. Renters and homeowners have no way to determine water quality in their cisterns. Love City Strong spearheaded a canvassing project to collect immediate needs water quality data following both hurricanes. Of 1,035 households surveyed in 2017, 973 use a cistern as their main water source. Of these 973 households, 817 had not cleaned or maintained their cisterns after the hurricanes. This data demonstrated a need for ongoing water quality testing of cisterns as well as water purification education. Love City Strong uses the Aquagenx CBT E. coli Kit to identify cistern water systems that have E. coli contamination for vulnerable residents because it is designed for low resource and disaster/emergency areas. CBT E. coli Kit test results allow Love City Strong to educate residents on the most practical, safest ways to manage and treat their cistern water. Phase 1 of water quality testing with the CBT E. coli Kit began in February 2018. All residents participating in the project were asked to complete an optional questionnaire. Data from questionnaires showed an alarming number of residents were unaware of certain recommended methods for treating and maintaining a cistern, both long-term and immediately following a disaster. This questionnaire data formed the parameters for Phase 2 of the project that began in June 2018, which is water purification using field tested laboratory equipment and chlorination metrics developed in partnership with the U.S. Centers for Disease Control and Prevention (CDC) and the U.S. Environmental Protection Agency (EPA). 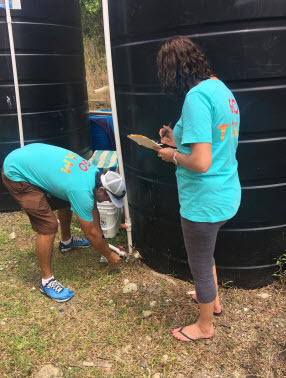 Love City Strong is developing a controlled chlorination treatment study with the goal of implementing new, safe methods for long-term cistern treatment that can be used by Virgin Islanders to regain access to safe, potable water. Love City Strong demonstrated the reliability of the Aquagenx CBT E. coli Kit by validating three randomly selected water samples from different locations across St. John and sending identical samples to an EPA certified lab located on a neighboring island. The comparison of testing methods confirmed the Aquagenx CBT E. coli Kit generates identical test results to the EPA validated testing method. 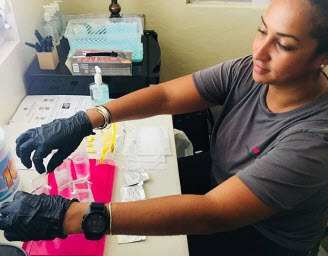 This positive validation of the Aquagenx CBT E. coli Kit demonstrates to partnering agencies and Love City Strong donors their organization has taken steps to mitigate potential issues involved with using only one testing method, and the testing method they use is reliable and accurate. Phase 1 water quality testing revealed ​more than half of the cisterns contained a high level of E. coli and residents’ cistern water was unsafe for drinking, cooking and personal hygiene. 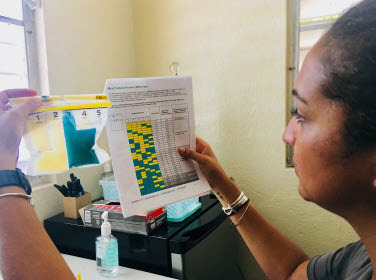 Following Phase 2 water purification, another round of water quality testing was done in July 2018. 200 households were tested. 64.9% of those households had no risk for E. coli, and 35.1% of households indicated high risk for E. coli, making cistern water for these households unsafe for drinking, cooking and personal hygiene.